Got black bear problems? 12 gauge buckshot can handle it. Moose on the loose? Buckshot. Two-legged predators? Buckshot will more than do the trick. 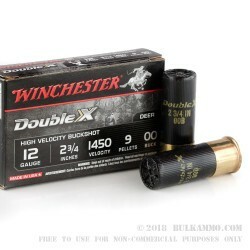 00 buckshot, or double-aught-buck, it a tremendously powerful and versatile load for your shotgun. Carrying the most punch down from the super-heavy slugs, it is more versatile in that it doesn’t need an unchoked barrel to fire from. You can use a standard field barrel if that is all you’ve got and transform that bluerock buster into a viable defensive offering. Winchester has been a world leader in the ammunition sphere for a long time, and their Double X is built to the highest quality specs. 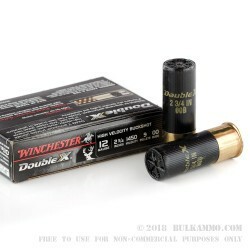 The 2 ¾” variety listed here is a great option for brush country deer, coyotes and other predatory vermin in close quarters where the sheer knockdown power of a 3” magnum load is not required (or desired for that matter). This 2 ¾” loading of double -aught is no slouch. 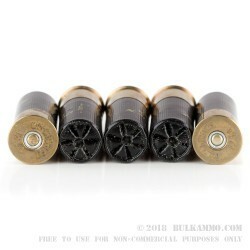 It’s pushing 9 pellets along at 1,450 feet per second, which is akin to putting nine 9mm ball slugs in a pattern about the size of a baseball at the same time, except 9mm ball ammo never touches those figures. With deer season right around the corner, go right on ahead and pick up a passel of Winchester Double X 12 gauge in double-aught. And if you don’t hunt deer, buy it anyway; you know it’ll come in handy someday.